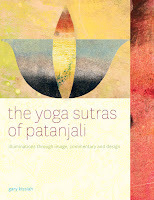 My philosopher friend (and general cool dude) Gary has written a beautiful book illuminating Patanjali's Sutras. My copy arrived the other day, and I'm just crazy about it. The Yoga Sutras are one of the most important works on yoga philosophy and many teachers emphasize the importance of studying the Sutras. However, many books on the Sutras are highly academic and make the study of the Sutras tedious rather than a delight and an inspiration. Our new book provides a new and inviting approach to studying and living the Yoga Sutras. Each Sutra contains the Sanskrit text, a plain-English translation, imagery and commentary. These innovations illuminate the heart of the Sutras and bring them to life. Zip on over to LilaLabs to order your own. I am blessed to be surrounded by so many talented and thoughtful folks. The sangha that has grown out of my yoga philosophy studies at CIIS several years ago has wrought such beauty in my life. 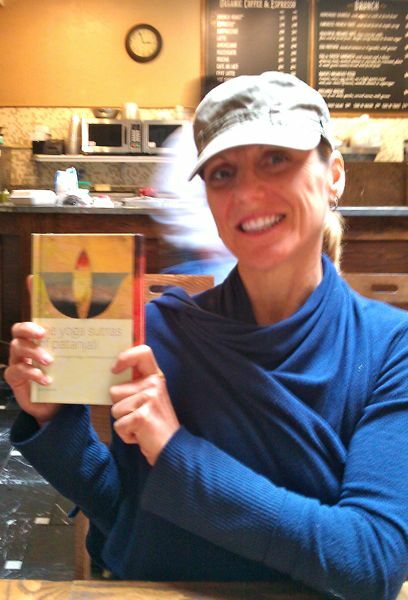 Yesterday I met with another friend and colleague from the program, Jennifer, who's planning her own empowered, prana-filled yoga creation (still-gestating, but stay tuned for more on that in the weeks to come). We had coffee with Gary's book, and I left abuzz — and not from the caffeine. There's so much good writing and reading and thinking and teaching to be doing. Sometimes I'm quite overwhelmed with how much of it I want to do. One word at a time...one step at a time...one breath at a time.